Rejuvenate and Protect your skin! 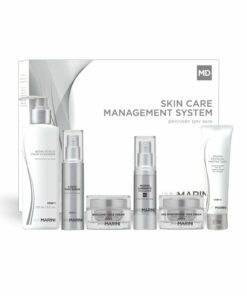 This powerful product combination reduces the visible signs of aging and decrease the risk of future damage. You will earn 139 LuxePoints! Rejuvenate & Protect Your Skin from the Sun! Jan Marini Physical Protectant SPF 45 is a physical broad-brand sun protectant and protects against both UVA and UVB rays. It contains antioxidants that neutralize free radicals to minimize damage. Contains ingredients that minimize irritation while calming and soothing skin. Contains ingredients that absorb excess oil. With its sheer tint and matte finish, this mattifying formula diminishes the appearance of a shiny complexion. Great for all skin types, Jan Marini C-ESTA Face Serum is a powerful antioxidant cocktail, featuring Vitamin C and DMAE, shown to reduce the appearance of fine lines and wrinkles and uneven skin texture. Preferred by subjects in a blinded split-face study vs. a leading Vitamin C solution, C-ESTA Serum is the preferred Vitamin C and antioxidant solution for younger, healthier looking skin. The sunscreen is a consistent favorite with Jan Marini Skin Management users! Apply sunscreen even on cloudy days as UVA penetrates through clouds. Inactive Ingredients: Water/Aqua/Eau, C12-15 Alkyl Benzoate, Butylene Glycol, Butyloctyl Salicylate, Cyclopentasiloxane, Cyclohexasiloxane, Phoenix Dactylifera (Date) Extract*, Poly Methyl Methacrylate/EDMA, Sodium Lactate, Sodium Hyaluronate, Glycerin, Carbomer, Yeast Extract, Acrylates/C10-30 Alkyl Acrylate Crosspolymer, Sorbitan Oleate, Triethanolamine, Fragrance (Parfum), Disodium EDTA, Phenoxyethanol, Imidazolidinyl Urea, Diazolidinyl Urea, Caramel, Yellow 5 (CI 19140). I love the serum and the tinted sun protection leaves a nice glow on your face.